I recently discovered Paleo People Banana Nut Granola. And I haven’t been the same since. Why? Because I haven’t had granola in any way shape or form since going gluten free. And this granola by Paleo People is certified gluten-free and grain free. It’s dairy free, too. Have I mentioned that this stuff is the jam? Because it is. It’s not good. It’s really really good. And quite addicting. 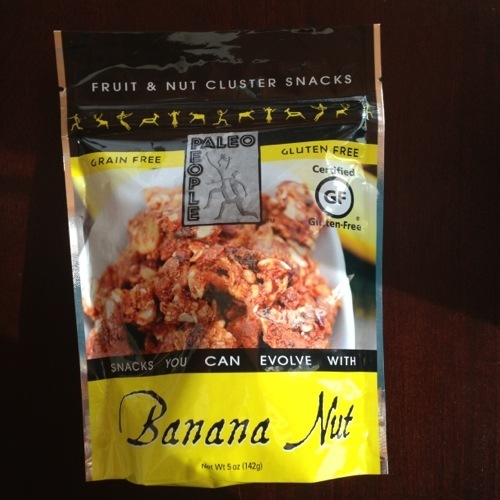 I was first introduced to the Paleo People Banana Nut Granola at my doctor’s office. They sell healthy snacks there and I always see a sign advertising gluten-free and grain free granola when I check out. I never had tried it before but one day I was starving because I fasted all day for my blood test and needed something to eat. The doctors office was kind enough to give me a sample. And it was all downhill from there. This stuff is like paleo crack. I bought a bag and I seriously need to limit how much of this stuff I keep around because it disappears that quickly…into my belly! It’s also got really clean ingredients. Here’s what’s in the ingredient list: Honey, Almonds, Pecans, Banana Chips, Raisins, Sunflower Seeds, Coconut Oil, Pumpkin Seeds, Dried Cranberries, Shredded Coconut, Flaxseed Meal, Spices, and Raw Cacao Powder. Yum yum. 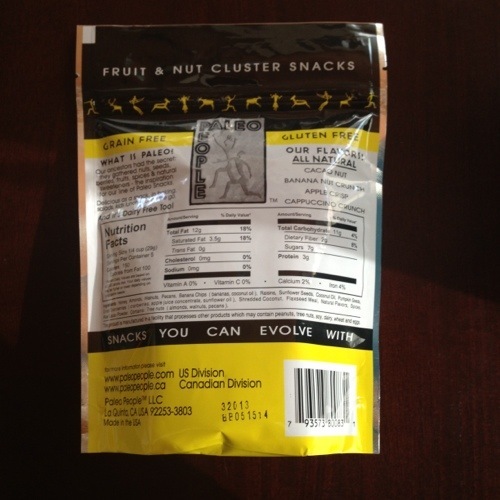 I’ve also taken a picture of the back of the bag with all the nutritional information so you can see for yourself. I eat this stuff plain as a snack but I think it would be a killer topping in chia seed pudding or just by itself in a bowl of almond milk or coconut milk. If you miss eating cereal or granola while eating paleo style, you might want to check this out. Or if you need a good, clean healthy snack this should be right up your alley. Especially if you love Banana. The Paleo People granola is quality stuff. It costs roughly $5.99 per bag, so it’s quite an expensive habit. I don’t buy it all the time because it is a bit pricey but when I do I thoroughly enjoy it. The Paleo People Granola comes in several other different flavors like cacao nut, apple crisp, and cappuccino crunch. You can buy on Amazon here. Enjoy! What about you? Have you had any type of gluten free granola? Would you try this type of granola out? Post in the comments and let me know.